Nebraska’s State FFA Convention was this week in Lincoln. The FFA students are inspiring and driven young minds with a growing voice. While they face a world much different than generations in the past, including the increasing gap of consumer knowledge about agriculture, they are armed with a growing new tool – social media. Social media includes Facebook, Twitter, YouTube, Pinterest and much more. While all are great ways to keep up with friends and family, they are also powerful tools. Tools that those who do not have firsthand knowledge of farming and ranching are using to broadcast an untrue message. Through social media, we are ALL journalists with the ability to be published instantly. Above is a graph from Neilsen, showcasing what types of information people trust. 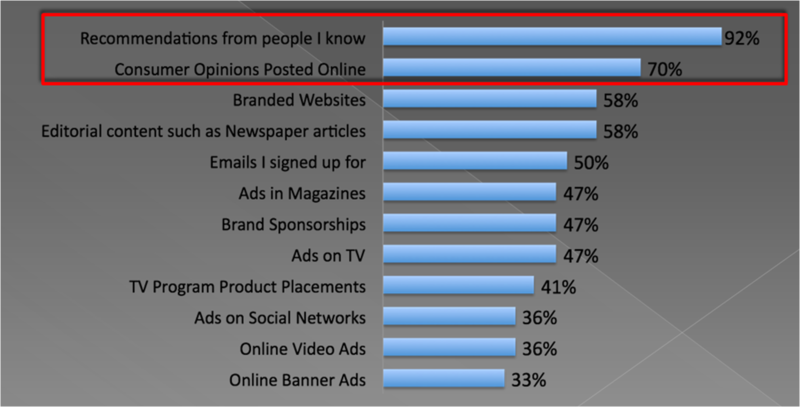 This is why you should care about social media – what other people say is what people trust. The goal should always be a positive outcome, view your role as a bridge builder and resource. You may not agree with the opinions expressed, but keep the golden rule in mind – treat them as you’d like to be treated. Keep on point. If the conversation begins to deviate, don’t be afraid to decline to comment, or provide them with resources that are experts. The internet is written in ink, not pencil – be sure you review your post before sending. Info and opinions can get lost in translation and again, the internet is written in ink. Unless they violate community guidelines, this makes you lose all credibility. These don’t all have to be original – use links or share posts from others. While there are some great and intricate videos out there, yours don’t have to be to show what you’re doing and why. See all of the photos from the 2013 Nebraska FFA Convention here!